Here’s a little look at our simple everyday life at Haus of Girls this past week via my Instagram phone photos. Last Friday our family walked in the Leukemia and Lymphoma Society’s “Light The Night” walk after raising money for my second cousin, Trevor. Everyone attending, which numbers were in the thousands, received a balloon filled with a tiny light. As everyone paraded through the city it was such a beautiful sight for a beautiful cause. Saturday we celebrated a special little boy’s fifth birthday with all things Mario. I killed this scary creature. Sophie practiced patterns. I got baby snuggles while watching the sidewalk chalk gang. I tried on my purty shoes for my sister Maggie’s upcoming wedding. And might I just say, thank goodness for online shopping or I never would have found the time to forage the malls for cute yellow shoes with a small-ish heel. Gotta love being almost six feet tall. This biker chick was all smiles despite her atrocious cough. Someone used her special “wear a hat” coupon that she earned thanks to good behavior. Gracie’s alphabet skills. My kid corralling skills. I am linking up with Jeannett over at Life Rearranged, are you? LOVE your fun set of pictures! I am obsessed with those yellow shoes! What color are the bridesmaid dresses? Wedding countdown is on!!!! YEAH! Glad you killed that ugly spider....eeeek!!! What a beautiful walk for supporting the cause of caner! L.O.V.E. the shoes and the invite!!! I LOVE weddings!!! 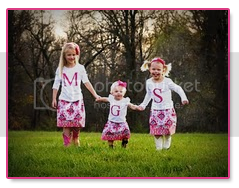 :) And your girls are precious, as always!